Aloo Bharta, Bhorta, Chokha, bhaate are various names of similar mashed potato dish from different regions in India (from Bengal, Rajasthan, Bihar and other states). 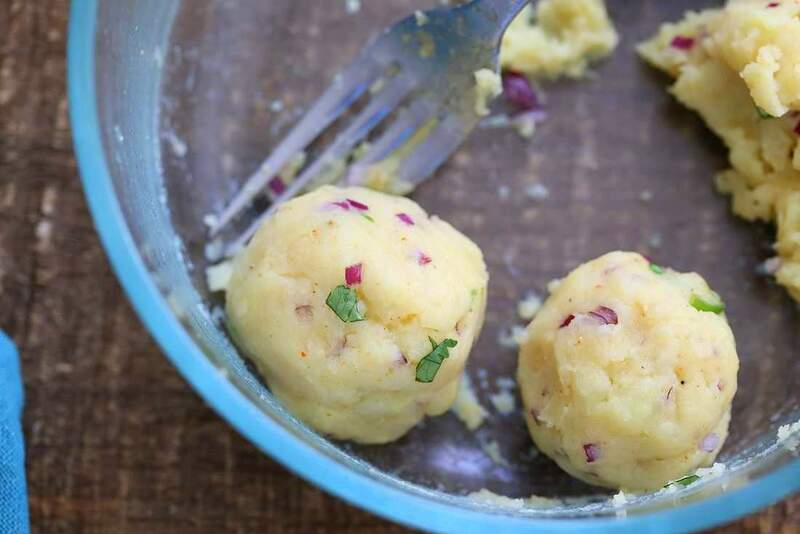 Mashed Potatoes are spiced and flavored depending on the the region, state, family, personal preference and served as side with dals and rice. 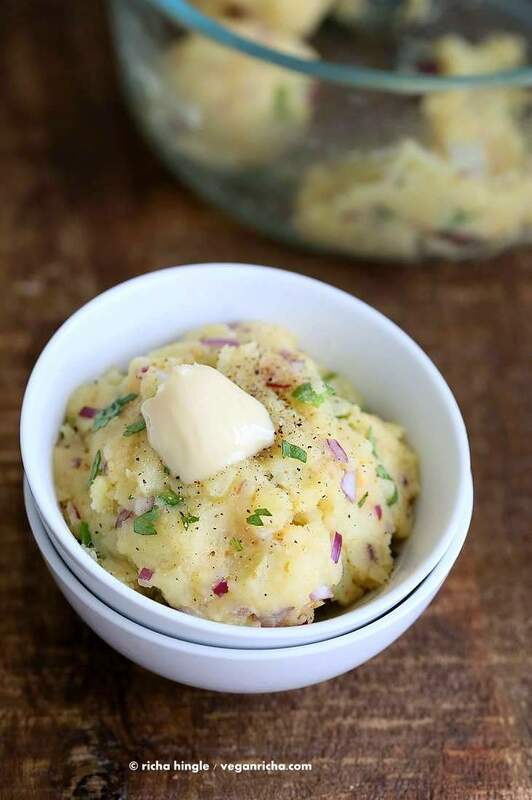 These mashed potatoes are lightly spiced, generally flavored with mustard oil. They are generally not made creamy with milk or butter or served with gravy. 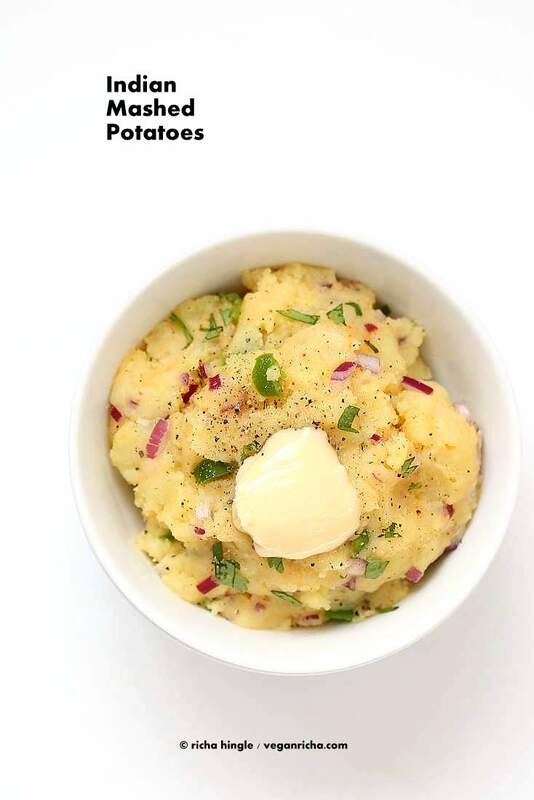 They are just spiced mashed potatoes. Often they are served as a scoop or ball for portion control. I mean mashed potatoes, in any form are addictive. 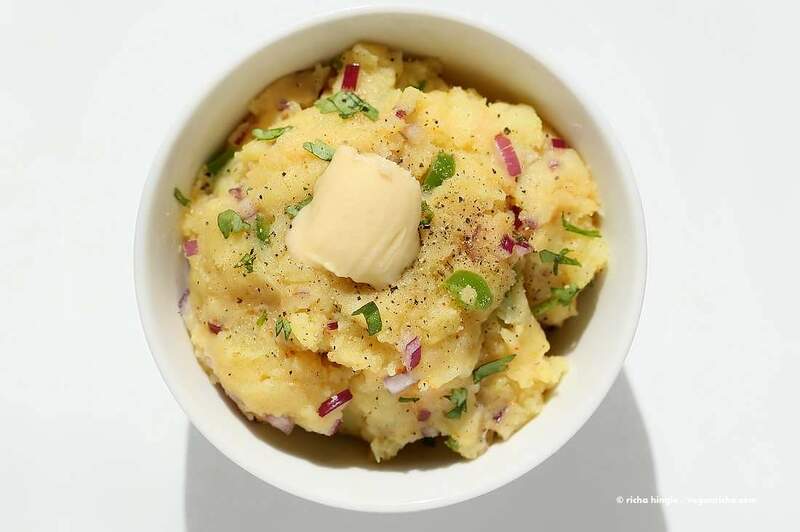 You can also add some cumin, cayenne and garam masala to your favorite mashed potato recipe for a creamy spiced version.
. You can also use sweet potatoes. To use up leftover aloo bharta, shape into patties and pan fry over medium heat to serve as snack or breakfast. Peanut Butter Tofu Bowl with the Best Mashed Potatoes. Cook and mash the potatoes really well. Combine all the ingredients. Taste and adjust salt and spice. Scoop into individual servings. Or serve in a bowl warm, topped with vegan butter or olive oil. Cook the potatoes. Boil, microwave or pressure cook(14 to 16 minutes) until well cooked. Peel if desired and mash well until very smooth. Add the rest of the ingredients and mix in. Add a Tbsp or so water if needed to smooth out the mixture. Taste salt and spice. Serve warm topped with vegan butter or olive oil and black pepper. To make without mustard oil: Use a neutral oil and add 1/2 tsp ground mustard and mix in. Or heat 1 tsp neutral oil in a skillet over medium heat. When hot, add 1/4 to 1/2 tsp mustard seeds and wait until they start to pop. Drizzle the tempered oil and seeds into the mashed potatoes. For variation, use cumin seeds to temper the oil. Nutrition Values is approx 1 of 4 Serves. What an awesome twist on the classic mashed potatoes recipe! I love the spices and flavors you added in! Mmmm this looks great. I love the idea of making patties for breakfast! wow, these look awesome! i never thought to add spices to mashed potatoes. these are the perfect thing to mix up a staple. Yumm! I can’t wait to try these. I love potatoes in any form. Made these last night. They were wonderful! Definitely a nice alternative to mashed potatoes. Of course I used my instant pot to cook the potatoes. But what a great addition to supper! The left overs tasted as fresh as the day before! Awsome!! so glad you loved it Brandie! These are the best side with any meal. Can’t eat mashed spuds any other way! Arghh CHILE is the country! So CHILLI is the hot spice! And not CHILLY which is cold! 😀 my book editor corrected all my chili to chile in my book. so it doesnt help my confusion. Sounds yummy, but where do you buy mustard oil? I’m in Tacoma, so maybe the store is close by!